Wow! If only we had been able to see into the future and witness that conversation as we struggled with language skills and inched our way through grammar, spelling, and writing in those early developmental years. What an encouragement that would have been! One thing that did help us, however, was my having learned that writing was a developmental skill and that the muscles in those tiny, little hands would need time to develop and strengthen. It would also require patience and a long-term outlook. In time, I learned many things about growing great writers; techniques I used with both our sons which I hope will also help and encourage you. Baby Steps. 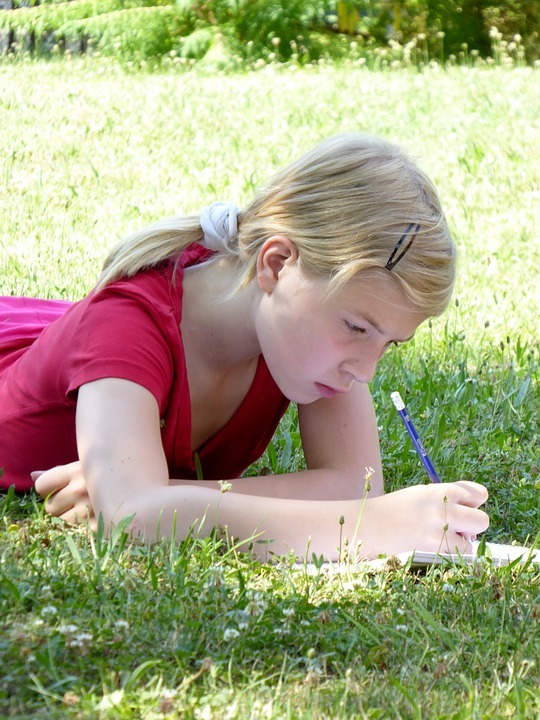 Writing is indeed a developmental skill. 15 minutes a day in the early years will suffice. Write EVERY DAY. As our sons’ writing developed and they progressed academically, things like reports, short stories, and research papers were more frequently required. But in their formative years, assignments as simple as a grocery list of ingredients for something they’d like to bake, a thank you card, postcard, or a journal entry more often filled the bill. Steer clear of monotonous writing assignments. Variety and creativity are key. Have them write about what they know, imagine, are interested in, are passionate about, or what they love. Are they (or you) getting frustrated? Try a different approach or lighten the load. The goal is to teach them to LOVE writing, not hate it. Invest in quality grammar and composition reference manuals, preferably ones that will take you through high school. They will serve as trusty companions as you help your children develop their writing skills. Give it time. Trust me. It won’t happen overnight. It WILL take years, but that’s okay. Slow and steady wins the race. Expose your children to great literature daily. Interestingly, one of the most eye-opening things I learned about growing great writers didn’t come until after our youngest graduated from our home school and entered college. It was only then that I discovered his skills as a writer, he believed, had come as a result of our having exposed him to great literature throughout his homeschool years. Providing our children with quality literature was something we had naturally done in our quest to give them a well-rounded education. Never for a moment had we considered, however, that in the process of growing great readers we were also growing great writers. But, of course! It made perfect sense! Whether they read independently or we read aloud as a family, they couldn’t help but notice the vivid words and beautifully constructed passages by authors of great renown. Whether our sons were conscious of this revelation at the time or not, great writers of the past had inspired and challenged them to become great writers themselves. Time and patience would teach them to love it. This entry was posted in Homeschooling. Bookmark the permalink. Nice article! What great authors did your children read? A list of titles and authors would be wonderful! Thank you, Shawna! There’s a list of a few of our favorites on Homeschool Legacy’s web site: http://homeschoollegacy.com//great-reads/. I hope it helps.